Finally, after many people asking me over the years, “How did you MAKE that?” after tasting my potato salad, I am putting the recipe up. This is slightly adapted from my father’s recipe, who got it from his friend Janice. It is legendary, both in my household growing up and to anyone who has ever tried it. One of the reasons it’s so good, I think, is that it gets rid of the things that most people don’t like about potato salad. The most common complaints I’ve heard (and given) about standard potato salad is texture (too runny); flavor (too sweet); and the sometimes not appreciated addition of onion or relish. Well, this recipe gets rid of all those problems and I guarantee that if potato salad isn’t usually your thing, this might change your mind. Now, this isn’t an exact recipe because I’ve never bothered to measure things. I know how it should be and I make it so. For a decent party-sized batch (or enough to keep around for a few days), start with 5-6 baking potatoes. Red potatoes would also work well. Peel the potatoes (unless they’re red potatoes) and chop them into large cubes. Rinse and boil with salt, a healthy dash of Tony Chacheres, and a tiny splash of crab boil (if you have any). Boil the potatoes until they can be pierced with a fork, but no longer. You want them to keep their shape, not turn into mashed potatoes. Boil a dozen eggs and peel them. Cut all the eggs in half and place the yolks into a separate bowl. Chop the whites roughly and set aside. While all this is going on, fry up some bacon (about a half pound). Since it’s all going to be crumbled anyway, I cut the bacon into pieces with some kitchen shears (easier than chopping) and throw it into a pan to cook. This is easier than standing over a hot stove flipping bacon. Just stir it around until it’s evenly browned, then remove with a slotted spoon to some paper towels to drain. Mash the egg yolks with a fork and add 1/2 – 3/4 cups mayonnaise, 1/4 – 1/2 cups sour cream (or plain yogurt), 1-2 tablespoons yellow mustard, and 1-2 tablespoons Dijon mustard. Mix well. This incorporates the egg yolks evenly throughout the potato salad and makes for a better tasting dressing. Season with salt, pepper, and garlic powder. You want this to taste a little strong, since it has to cover the potatoes and eggs (which are, for the most part, unseasoned). I like to mix this up in batches, ensuring even distribution of ingredients without squashing the potatoes to all hell. 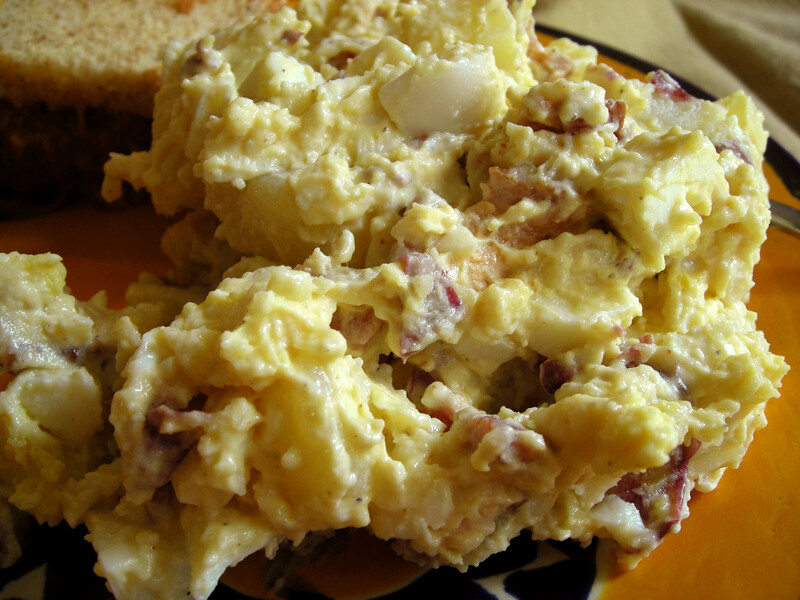 Pour a third of the potatoes, egg whites and bacon into your serving bowl, add a third of the dressing, and mix. Continue to do this until you’ve used all the ingredients. If you find you want more dressing, just mix more mayonnaise, sour cream, and mustard together with the seasonings and fold that into the salad. This is good warm or cold, and of course just gets better the next day. I made this today to serve with my Crock Pot Pulled Pork (another good dish) and it was a total success. My friend, A, once pointed out that most people are either bakers or cooks—very seldom are they both. And I think she’s right. I think I’m a pretty good cook, but I have absolutely no instinct when it comes to baking. That might completely change if I ever have a kitchen big enough to allow me to work with dough, but until then, thinking about the intricacies of baking is still scary to me. More experimentation today, this time with the chocolate-orange cookies. I’m trying to make a healthier version: less fat, less sugar, lower glycemic index kind of a deal. My thinking is using something other than butter (Smart Balance for today’s trial), baking Splenda, brown sugar Splenda, and half oat flour. So when I decided to tweak my cookie recipe, I didn’t know what to think! Would the oat flour change the rise of the cookie, does using less brown sugar (because the Splenda blend is much sweeter) change the way it creams with the butter? What if what if? And I don’t have enough experience to answer these questions. A week ago, I tried a version of this cookie using agave nectar instead of sugar, rolled oats, only 2 tablespoons of butter, and some olive oil. *oat flour can be made at home by putting rolled oats into a food processor and grinding until it is fine and flour-like in consistency. Since I am currently without a food processor, I buy Bob’s Red Mill, a brand that offers a lot of different gluten-free alternatives to traditional flour. Cream butter and sugars together. Add vanilla and egg and mix thoroughly. Add orange zest, mix, and let the batter sit for a few minutes so the orange oils really permeate the other ingredients. Add the baking soda, baking powder, salt, and cinnamon. Gradually add in the flour, then stir in the chocolate chips. Drop by rounded teaspoon onto a baking sheet and bake at 375 degrees for approximately 10-14 minutes, until golden brown. Allow to cool briefly, then remove cookies to a cooling rack. Cool completely before storing. And the verdict? These aren’t bad! They’re more crumbly than my original recipe, but crumbly the way shortbread or peanut butter cookies are. Still quite tasty and more to my liking than the last time I tried it. Success!! You are currently browsing the Fixin' to Eat blog archives for April, 2009.